Businesses are getting conflicting advice about online marketing. Soon that advice is going to collide and there is going to be one massive fall out. 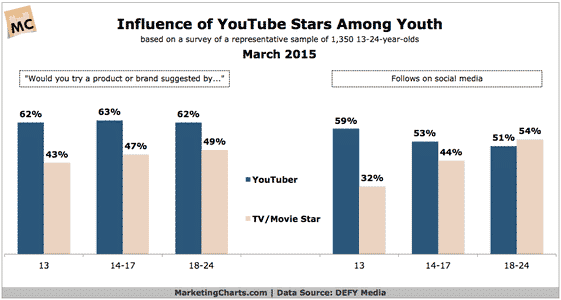 Take a look at the latest data about the influence of “YouTube Stars“. It turns out that people aged under 24 are heavily influenced by them – more than by TV or film personalities. For years, of course, we have heard that every new media channel will kill off another. We were told that videos would see the end of cinema – it didn’t happen. We were told that radio would spell the end of newspapers – they are still with us. And we were told that email would stop real mail – yet the post offices are still busy sorting letters. Every time a new medium is invented it merely adds to the variety, providing people with more choice. But online content is different. It has the power to produce one of the most significant changes in media history. In the past if you were a big brand you could get your message out to the world by buying space in newspapers and magazines and having a media relations team that ensured your name got into the headlines whenever possible. Public relations is a key component of most major brands. But PR is also an essential component of local businesses and small specialist services. They get coverage in local newspapers and specialist trade periodicals. However, there is now a problem which did not previously exist. Online content. In the “good old days” where brands held lunches with journalists, took them on fancy trips or invited them to swish press events, there was something in it for both sides. The brands got coverage and the journalists got material to fill their column inches or broadcast schedules. It was a deal that worked for everyone. Nowadays, though, brands have their own outlets which compete with the media. Only yesterday I was talking with the Communications Director of a major sporting brand who has more than 30m people looking at their Facebook page each week. That channel is much more important to the company than the ten million who might be watching the TV news tonight. Imagine now that you are that Communications Director and you have information you want your audience to get. What are you going to do? Are you going to – as you did in the past – hold a press conference and give it to the media? Or are you going to keep it to yourself and distribute it through your own channel? The traditional media have gone from being partners for businesses communications, to being competitors – all because of the ability for brands to produce their own online content. The result of this is that the traditional media are slowly being starved of the raw materials they need for their publications and broadcasts. Inevitably, this will lead to reduced value to the audiences who will go direct to their favourite online content instead. However, eventually people will realise that what they are consuming is biased. When brands provided information to the media through PR, it at least went through an editorial process that helped provide a degree of balance. Now, online audiences only get biased material and eventually they won’t like it. But by then, much of the traditional media will be polarised into aggregating material you can already find free of charge elsewhere or celebrity tittle tattle. Yet there is another way for both businesses and the media. Analysis. Newspapers, magazines and broadcasters are going to have to give up the notion of reporting business news. Thanks to online content we can all get the news we want direct from the companies we want to engage with. Instead, the traditional media needs to change to being more analytical – taking the content that the brands produce themselves and comparing and contrasting it and analysing it. That would provide a service to their audience and it would not compete with the businesses who have their own online channels of content. And what does this mean if you run a business? It means that audiences are going to look direct to you for news content – so you had better start producing it. It also means that journalists are going to look to you for data and insights, not news. So you had better start doing that as well. The YouTube Stars have realised this already. Have you?